I read Gina’s freshman novel, Crossing Oceans, several months ago and was very, very impressed. I didn’t review, and can’t honestly recommend it, but that’s ONLY because of the subject matter [Mom with young daughter, Mom dying of cancer] and how it hit WAAAAAAAAY too close to home for me [Mom died of cancer when I was 10; had I realized what the plotline was, I would have steered clear – but all I saw was friends I trusted gushing about it so read it without reading the back cover – by the time I realized I probably shouldn’t have started it, Gina had sucked me completely in, which says scads about the quality of the writing]. 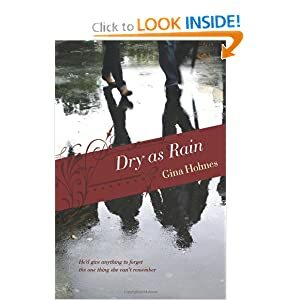 But the writing was so good, that when Gina put out a call for influencers for her sophomore offering, Dry as Rain, I jumped over to Amazon to check it out. The topic was quite different and something I thought I’d find interesting. A marriage in shambles, but then she [Kyra] has a car accident leaving her with partial amnesia – mainly that their marriage is little more than a farce by that point. In fact, Eric isn’t even living at home anymore. Everyone in Kyra’s life goes along with the doctor’s orders not to tell her what she doesn’t remember but to let her remember on her own. To an extent that feels almost plot device-y to me, but I’ll give Gina the benefit of the doubt – that a doc really would say that [especially since my experience with amnesia is mostly on TV – where it’s rarely more than a plot device ;)]. So no one tells Kyra what’s going on. The whole book is written in first person from Eric’s point of view, so we never really see what Kyra is thinking or feeling about the whole matter. But in Eric’s mind, he’s getting a second chance to fix everything that was broken – if he can truly figure out what it is. Dry As Rain is just as well written as Crossing Oceans. I was sucked in and didn’t put it down until I was finished. I think this is classified more as Women’s Fiction [though the main character is male] rather than romance, but I still expected a happily ever after, which I got. I don’t, as a general rule, read tons of WF, but I enjoyed this one and would recommend it to friends who like more serious tones in their reading. Thanks to Gina and Tyndale for a free copy in exchange for influencing. This is my unbiased opinion.